In 1513, Juan Ponce de Leon sailed south from his earlier landing in St. Augustine and found a “bright nameless great bay…and fresh springs in the rocks.” There are several stories about how the great nameless bay came to be called Biscayne Bay. Most assume that it is a variation of the Bay of Biscay, in the Atlantic Ocean north of Spain and west of France. Others maintain that the bay got its name because of a 1500s wreck in the bay of a ship owned by a man called El Biscaino. Another theory holds that the bay was so named after Don Pedro el Biscaino, who lived on one of the islands in the bay and had been the Keeper of the Swans at the Spanish court. Still others believe that the bay was named for Viscaino, who is said to have been a wealthy merchant in Manila. Whatever the origins of its name, Biscayne Bay is and always has been a “bright, great bay” that has attracted explorers, adventurers, residents, and tourists. Not only is it a source for food, transportation, and commerce, it also offers boundless opportunities for recreation, education, and spiritual nourishment to those who visit and live near it. Biscayne Bay is the largest estuary on the coast of southeast Florida and is contiguous with the southern Florida Everglades and Florida Bay. It encompasses a marine ecosystem that totals approximately 428 square miles. Its drainage area is 938 square miles, of which 350 are freshwater and coastal wetlands in Miami-Dade, Broward, and Monroe Counties. It is home to Biscayne National Park, the largest marine park in the national park system, Oleta River State Park, Bill Baggs Cape Florida State Park, the Biscayne Bay Aquatic Preserve, Barnacle State Historic Site, and numerous local parks. Even if you and your family are staying at a Orlando hotels for a Disney trip, it's well worth your time to take a bit of a detour and discover Biscayne Bay. 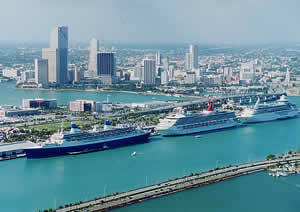 The bay is also the location of the Port of Miami, one of the largest passenger and commercial ports of call in the world. In addition, the Miami River, one of the largest tributaries to the bay, is a working river and is Florida’s fifth largest port and the primary service area of international trade to the Caribbean. The Miami River is also home to some of Miami’s most historic and scenic neighborhoods. Indeed, Biscayne Bay is many things to many people. It supports important sport and commercial fisheries. It is a source of environmental education and recreation. Its waters and shores are favored for sailing, boating, snorkeling, swimming, bay viewing, and sunbathing. More importantly, the bay is ecologically significant, supporting and nurturing an enormous variety of wildlife. Enjoy a home away from home that's close to both Florida's coastal wetland ecosystem and the excitement of Miami. With warm temperatures year-round and unlimited marine activities, if you've never traveled to Biscayne Bay and have yet to experience all the fun activities, then consider renting timeshare here first for an amazing South Florida vacation! Biscayne Bay is part of a large south Florida ecosystem and relies upon water that flows directly from the Everglades, through the Biscayne Bay watershed, and into the bay. The recent passage by the United States Congress of the Comprehensive Everglades Restoration Plan, and the planning and implementation of other regional land and water management efforts, have focused attention and resources on problems facing the Everglades and the south Florida ecosystem. It is critically important that as these processes go forward, planning and decisions be made within the context of the broad south Florida ecosystem, including Biscayne Bay. Countries around the world have persevered to ensure that water management efforts are enforced to save bays as it is vital for the community to live. As we begin the new millennium, we have many opportunities to find new and better ways to enhance the bay’s health and its strength as an environmental and economic resource. The challenge is to achieve the delicate balance between maintaining, protecting, and restoring the natural systems that keep the bay ecologically healthy and productive, and dealing with the needs of growing numbers of people who want to use and enjoy it.